The boy's behaviour...: Using the right goalkeeper! It’s not just a moving goalpost – it changes shape all the time too. That’s what my husband said about triggers, after we talked about how Mini’s triggers not only vary depending on his mood, but they can change too – what would cause a meltdown one minute, doesn’t five minutes later. This got me thinking about the different strategies and techniques we employ to deal with Mini’s behaviours. 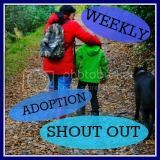 Our CAMHS therapist reminds me frequently that adoptive parents need lots of tricks up their sleeves because just like triggers, sometimes a technique will have an effect, sometimes it won’t. I’ve shared some of our techniques on various pages of this blog. Sometimes I’ve been absolutely certain that something is working, and at the time, couldn’t imagine it ever changing because it was great, then a few months later, I’ve had to stop that technique because it simply didn’t work anymore…Mini had gotten used to it, and it’s effectiveness had vanished. Other times I’ve been a little reserved about trying something new because I don’t want to constantly experiment on Mini, until we know more about what’s behind his issues. I don’t want to damage him more. And I’ve also been wary about re-trying things we’ve done in the past…they didn’t work then, so why would they now? I’m quite an analytical person, and I like to understand why Mini behaves as he does, then I criticize myself, my actions and my mistakes. I’m learning to be more reflective so I can make those mistakes work for me and Mini. Over the last 6 months I’ve learnt that I need to be more adaptable and quicker-thinking. I’ve also learnt that although Mini loves routine, thrives on it even, sometimes I need to give responses that aren’t routine, and are not expected. I need to throw him some curveballs sometimes. These curveballs make him think; make him stop in his tracks. Sometimes, this means trying something new or something that I’ve tried before. So from now on, I’m not going to shy away from new techniques, or old ones for that matter. I’m gonna store ‘em up, keep ‘em on my subs bench and pick and choose what I use, and when. Those goalposts might move and change, but I’m gonna have the right goalie to put in place. All the while remembering to PACE myself…Playfulness, Acceptance, Curiosity, Empathy. I think - for any parent - the more tricks we have in our pockets, the better we do. There is no one thing that will always work to address problemmatic behavior (if only, right?!). As far as triggers, that's something I ponder about, too. Though my kiddo doesn't have meltdowns like Mini does, he does have some. I'd love to know his triggers. But, a Montessori teacher of his challenged me on it one day. He suggested that if we (I) spend too much time/energy of figuring out the "why" of the behavior, I don't spend enough time/energy in addressing it appropriately. that regardless of they "why" the behavior itself is unacceptable. While, I still feel like it's helpful to know the "why" behind the behavior, I also recognize that there are times (many!) when I'll never know the "why". Which is why a large variety of tools is so helpful! my son like routine and he at the moment is pushing my buttons. hes having tantrums and strops when i saw you cant have something. he also done it when out with a friend and his mum and at youth club but because they know about the strops and the lack of understanding consequences they deal with him. hes 8 yrs old 9 later this yr emotionally he alot younger. im afraid to say ive got absolutely no patience anymore. having been a nanny and cared for many children it didnt not prepare me for adopting our son. im always thinking whys he acting like this? these behaviours havent recently happened at school.